The Artist as Lawyer, a Podcast Interview with Sergio Munoz Sarmiento about Art Law Should Government Criminalize Violent Artistic Expression? Joan Kee, Associate Professor in the History of Art at the University of Michigan, former lawyer in Hong Kong and New York, and author of numerous articles on contemporary art and law on topics such as artistic uses of police evidence, stalking and harassment, property laws and contemporary Chinese art, and artists’ rights. Her book, published by University of California Press, examines the relationship between contemporary art and the law through the lens of integrity, and how in the 1960s, artists began to engage conspicuously with legal ideas, rituals, and documents. Sergio Muñoz Sarmiento is an arts lawyer and founding director of The Art & Law Program. He is interested in the relationship between art and the law, with a specific focus on tangible and intangible property, freedom of expression, and outlaw culture. He has lectured, taught and written on art law matters in a wide range of institutions and publications. Sarmiento represents and advises visual artists and art’s institutions in matters and disputes related to intellectual property, contracts, artist legacies, and tax-exempt entities. Please e-mail shaina.cash@artlawoffice.com if you plan on attending. Please note that submitting an RSVP for this event does not guarantee entrance. This is a free-access event—entrance will be on a first-come, first served basis. This event takes place in New York City and during the CAA conference. The ILR Conference Center is a 10-minute walk from the New York Hilton Midtown. This event is organized and sponsored by Cornell Law School and The Art & Law Program. 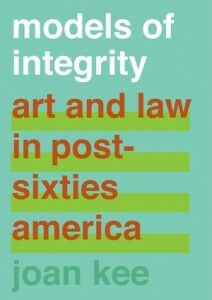 Models of Integrity: Art and Law in Post-Sixties America, examines the relationship between contemporary art and the law through the lens of integrity. In the 1960s, artists began to engage conspicuously with legal ideas, rituals, and documents. The law—a primary institution subject to intense moral and political scrutiny—was a widely recognized source of authority to audiences inside the art world and out. Artists frequently engaged with the law in ways that signaled a recuperation of the integrity that they believed had been compromised by the very institutions entrusted with establishing standards of just conduct. These artists sought to convey the social purpose of an artwork without overstating its political impact and without losing sight of how aesthetic decisions compel audiences to see their everyday world differently. Addressing the role that law plays in enabling artworks to function as social and political forces, this important book fills a gap in the field of law and the humanities, and will serve as a practical “how-to” for contemporary artists.